Do you play tennis? Let´s play! Do you like sport? Are you keen on it? Do you play tennis? It´s great if you do! 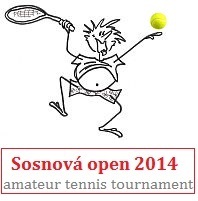 😉 Sosnová organizes a traditional amateur tennis tournament Sosnová Open. This long-term tennis competition has taken place since 1997. So, if you want to meet new friends, compete with other players, sweat as if playing a grand slam tournament, don´t hesitate and send us your registration (ergosena@cbox.cz). The registration deadline is 14th of May.